[Master Carpenter] got up and said to him, “Come, chief, my child, let me dress you up.” Then he went to him and he put fair-weather clouds upon his face. “Now, chief, my son, come and sit idle seaward.” As soon as he did so, the weather was good. 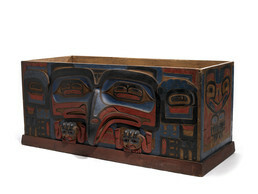 This chest for storing ceremonial regalia belonged to Gida’nsta, chief of Skedans. The front panel shows Raven grasping two human figures dressed in rod armor. The image on the side panels is probably Xyuu, Southeast Wind, whose ten brothers were clouds. One of them, Cirrus Clouds, may be represented here by eyes and feathers on either side of Raven. Cirrus clouds were the potlatch attire of Tangghwan Llaana (Sea Dweller), the supreme ocean spirit, who belonged to the Raven moiety, and were also thought to represent bird-skin clothing that Shining Heavens, a sky deity, put on to bring fair weather.